If you have several identical rooms set up in the Backoffice, but don't want to display all of them in the Frontoffice, please follow the steps below. 2. For better visualisation in the Frontoffice, choose the same Frontoffice title for all identical rooms with the same type, and a different Backoffice title for better management through the calendar and reports. 3. Contact our support team through the chat in your Backoffice to enable this functionality. The Frontoffice will then display only one room per room type inside a package. It's important to note that, after the first room is fully booked, the system will present the following one, until they are all booked out. obs: Since all Double Rooms are set up with the same Frontoffice title, users won't see the Backoffice titles such as: "Double Doom 1", "Double Doom 2", and "Double Doom 3". This feature works only inside a package. Do you only offer accommodation and not packages? How to still display one room per room type at once? 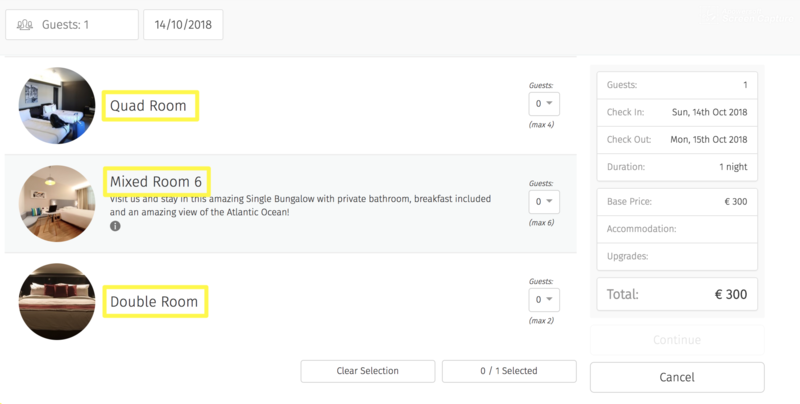 In this case, you have to create a package that includes all the accommodation options with the same room type. For example, your business has three double rooms, three single rooms and three family suits. 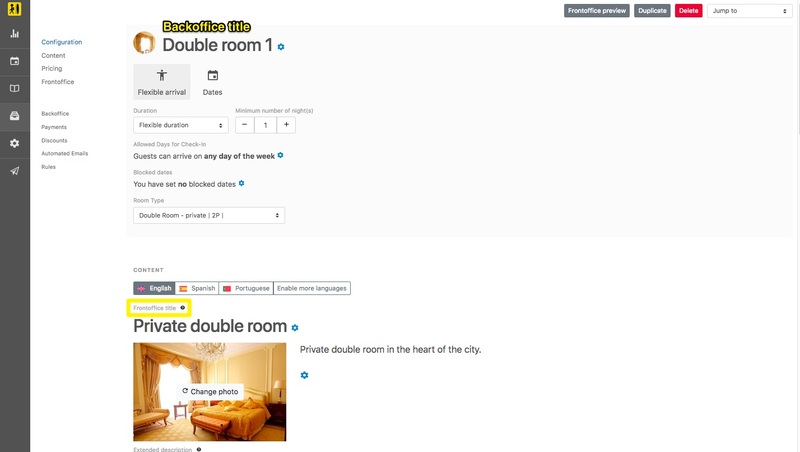 In order to present only one of each in the Frontoffice, you should create a package per room type and add the Accommodation Title as Frontoffice Title (e.g. Double Room, Single Room, Family Suit). Add the pictures and descriptions accordingly. The client will now only see one room per room type in your Frontoffice.